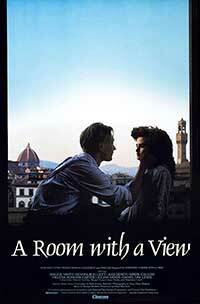 The 1985 Merchant/Ivory film A Room with a View — adapted from the E.M. Forster novel — revolves around the acquaintance of two British cousins who complain about the lack of a view in their room while vacationing in Florence and a man with his son, after the latter gentlemen volunteere to switch them. As days pass the younger cousin and the son feel attracted to each other, something which the elder tries to provoke. I have not read the novel, but I am convinced that it must have been better than the film. Before starting to explain, what I want to say is that the first shot was a little abrupt and I needed some sort of emplacement to get to the point. Specifically, I felt like many moments in the movie were superficial, while there times it was confusing. I have the impression that they might have overlooked or skipped many important moments from the book, as I felt there were some plot gaps, that made the movie unconvincing. I also felt that the pace of the movie was tedious, because it is almost two hours and the events could easily be summed up in ninety-minutes — another aspect that makes me question the quality of the screenplay adaptation. I mean, can a book have so few things to say? Although I wanted so much to engage with what was happening, I was really disappointed with how poorly adapted it seemed to be, which makes me unable to understand how on Earth it won an Oscar for best writing. For sure, now I am really interested to read the novel. However, I loved the sarcasm and humor used in many scenes like in the beginning, when we see the cousins acquiescing to switching rooms takes too much time, too many people involved, as if it were some sort of negotiation, teasing the etiquette of the time. Lucy Honeychurch, Miss Bartlett’s cousin and charge (Helena Bonham Carter): She is the young protagonist, who is going on vacation with her older cousin as her chaperone in Florence for the summer, where she falls in love with the dashing George Emerson. After her vacation she gets engaged to another man and when she meets up again serendiptously with George, she has to choose between the two. Charlotte Bartlett, a Chaperon (Maggie Smith): She is the elder cousin of Lucy and in charge of her during their vacation in Italy. When she realizes that something is going on between Lucy and George, she forbids her to see him again and they lie to her mother, as it is something that would anger her off. George Emerson (Julian Sands): He is the son of Mr Emerson, an English tourist. He is portrayed as melancholic and introverted. He appears to have a strange way of perceiving the world and he seems to spend much time philosophizing. He cares more about others, the world and values than other people of his class do. Mr Emerson, an English tourist (Denholm Elliott): He is the father of George. He cares much for his son and feels unnerved watching him torture himself with all these thoughts, and that’s the reason why he asks Lucy to help him out. Also there are many times when he talks on behalf of his son’s feelings, as George is many times unable to express himself with words. Maggie Smith and Denholm Elliott were amazing in their performances, as the grown-ups in charge of protecting and helping out the younger generation. My favorite was Helena Bonham Carter’s acting. Even though she was young, she was great in her role contrary to Julian Sands’ acting which did not impress me at all, as I found it a little bland. I loved the aesthetic of the film, with all the costumes, the British accent, the social gatherings and the traditions of the era. Director James Ivory provided us with really captivating scenes of Florence and made us feel like tourists wandering around the magnificent landscapes of Italy courtesy of the magnificent cinematography of frequent Merchant/Ivory collaborator Tony Pierce-Roberts (The Remains of the Day, Howards End). Costumes were also well made and I enjoyed all these hairstyles and fashion choices of the period. The cinematography was my favorite part of the film, as the viewer observes reflections, chiaroscuro, tourist attractions, vintage furniture and interior design and the most important — countryside with all its beauty and the abundant use of flowers, sometimes worn on women, other times dominantly existing in the landscape. I would rather it had won an Oscar for cinematography than writing. The ending is exactly what the viewer expects, closely related to the first scene but with a major difference. A young British woman touring Florence with her elder cousin as her chaperone in 1900 meets a young man and begins to fall in love -- but she already has another suiter that she is promised to in this 1985 Merchant/Ivory adaptation of the E.M. Forster novel that is defined by their signature lush cinematography and a powerful debut from lead Helena Bonham Carter.